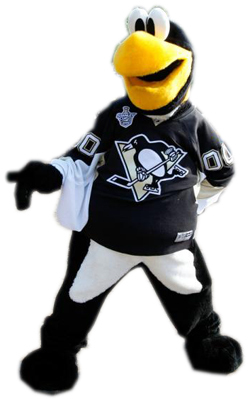 •Iceburgh’s first jersey was made by sewing two size 60, goalie-cut jerseys together. • Iceburg was in the movie Sudden Death, written by the wife of Penguins owner Howard Baldwin. “Penguin Pete,” an Ecuadorian-born penguin on loan from the Pittsburgh Aquazoo – made his first appearance in front of 9,198 fans at the Civic Arena on February 21, 1968. The bird was a ninth birthday “present” to Doug McGregor, son of Penguins president Jack McGregor (photo at left) and met the young McGregor perched atop the dasher boards in the arena. Pete made one more appearance in the first season and the hockey team planned for Pete to make regular appearances with the team in 1968-69. “We had special ice skates made for Pete by CCM in Canada. 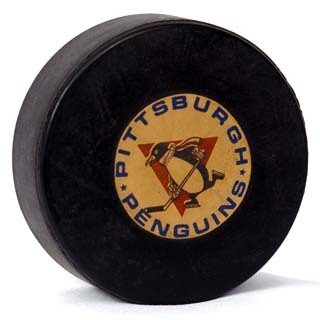 Penguins have leg deformities that require careful construction, almost counter-intuitive, of a hockey shoe. They’re pigeon-toed, bowlegged, weak-ankled and knock-kneed,” explained Jack McGregor. A skater from the University of Pittsburgh showed Pete how to skate at the arena. The crowd roared when Pete finally led the team onto the ice of a game against the Boston Bruins on October 19, 1968. Pete made six more appearances, his last on November 16, for a game with the New York Rangers. Carol McGregor (credited with naming the team, Jack McGregor (President) & Jack Riley (general manager) with “stuffed” Pete. The November 21 edition of The Pittsburgh Press reported that Pete “was gravely ill with pneumonia” at the Highland Park zoo. Pete died on November 23, 1968 and was sent to an area taxidermist, later to be displayed in the lobby of the Penguins team offices at the arena. No one can pinpoint the date, but Pete quietly disappeared from the lobby after a few concerned callers objected to the stuffed bird, according to McGregor. A second penguin mascot was loaned to the team and made it through the 1971-72 season. “I remember that (Pete) died and that they brought in another one. They called the second one ‘Re-Pete,'” said Penguins goaltender Les Binkley. LEFT: Penguins’ mascot “Penguin Pete” or “Re-Pete” is paraded on the ice at the Civic Arena in Pittsburgh during an intermission of a game between the Penguins and the Buffalo Sabres on October 10, 1971. Buffalo won the game, 2-1. The Penguins’ current mascot was created at the urging of Martha Johnson (wife of former Penguins coach Badger Bob Johnson). A “name the mascot contest” was held by the team and Eat ‘n Park restaurant and Iceburgh debuted in for the 1992-93 season. Iceburgh was known as “Icey” in the 1995 film Sudden Death written by Karen Elise Baldwin (wife of Penguins owner, Howard Baldwin) and was filmed at the Civic Arena. Iceburgh has worn a variety of customized jerseys, some requiring two goalie size jerseys being sewn together. RIGHT: Iceburgh with a 2008 Stanley Cup Final patch on his sweater.